In Todos Santos, Mexico, on the Baja Peninsula, surfers keep their favorite spots to themselves. IT was a blazingly bright afternoon on Cerritos Beach just outside Todos Santos, Mexico. The air was hot and dry and smelled like frying fish. Neighborhood children jumped up and down in the shoreline ripples as their parents lingered at picnic tables with tacos and icy beer. Out in the water, a dozen surfers were lying on their boards, waiting to paddle as the next swell approached. When they’re feeling friendly, Todos Santosians say that they go to bed when Cabo is going out. When they’re feeling less so, the comments are not as gracious. “Cabo is more for people who cut the necks off their Corona T-shirts,” said one expat waiter. Those nooks have started drawing a certain kind of traveler to the area — the kind that comes to spend a few days browsing fine art, surfing the breaks and taking in the vibe of an older, more traditional Mexico. What the newcomers find is a miniature, seaside Santa Fe, complete with good food and stylish hotels. My second night in town last month coincided with the kickoff of the seventh annual Todos Santos Film Festival, a four-night event that showed 12 feature-length movies and dozens of short films about Latino culture or created by Latino filmmakers. Just wandering around the half dozen blocks of town, it was obvious that the festival was in full swing. It was a warm night and sidewalks were crowded with people talking about what they’d just seen, walking in small groups to the next venue, or heading over to the Todos Santos Inn for a post-movie glass of wine. In the 19th century, long before it was a hideaway for tourists who don’t think of themselves as tourists, Todos Santos was the sugar capital of Baja. A century later, it was a sleepy little village that attracted the attention of an American painter and sculptor named Charles C. Stewart. According to local folklore, in the early 1980s a census taker knocked on Mr. Stewart’s door and, seeing his work, made a note that Todos Santos was an artists’ colony — despite the fact that there was only one. It took a few more decades, but over time Todos Santos quietly became a refuge for an art crowd. At the same time, surfers were arriving to escape the growing congestion in Cabo. And they aren’t all that eager to share all their discoveries. When I asked Mr. Becerril what beaches he likes to surf on when he isn’t teaching, he became quiet. “It’s just that they’re not that well known yet and locals like to keep it that way,” he said apologetically. Surfers and artists aren’t the only migrants in the area. Leatherback turtles, once plentiful in Cabo San Lucas but pushed out by the big resorts, have started seeking refuge here. But they need help. The group built a greenhouse on the beach to protect the hatchlings, and now the nesting turtles have become their own attraction, eagerly watched as they lumber up onto the beach to lay their eggs. “They look like giant S.U.Vs coming out of the ocean,” Ms. Dvorak said. My last day in Todos Santos started at 5 a.m. Those giant SUVs lay their eggs only at night, so there I was: numb to the bone and careering down an untouched stretch of beach on an all-terrain vehicle, the Pacific barely visible in the blackness, clinging to my guide, a burly man named German (pronounced her-MON). There were no turtles that morning, but German and I glimpsed another predawn ritual: A pickup truck pulled up to the beach and four surfers jumped out, grabbing their boards out of the back. They had sneaked out under the cover of darkness so tourists wouldn’t get wind of this place. For the moment, Todos Santos seems to have the perfect surfing balance: a steady stream of surfers, year-round waves and great breaks, like Playa Cerritos, and (with apologies to the locals) the emptier Playa San Pedritos and Playa La Pastora, just north of town. Maybe so, but there are still no major surfing competitions, surf shops or Quiksilver representatives in Todos Santos. 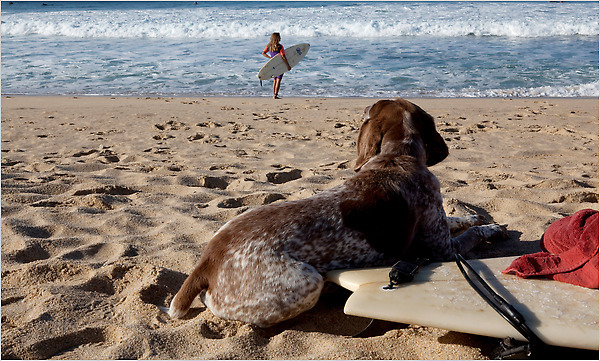 And the surfers and artists have made great companions in this town. The former have managed to keep prices down and taco stands busy (the best fish tacos this side of anywhere are at Taquería El Parguito on the corner of Santos Degollado and Del Huerto), while the latter have attracted the more sophisticated travelers and new hotels. A few years ago there were only a couple of places to stay: Hotel California, a gallery-plus-hotel (with no relation to the Eagles song), and the charming, colonial Todos Santos Inn. Despite the concerns of the locals, Todos Santos, a one-traffic-light town, is small by any measure. Fly into Cabo San Lucas and rent a car to drive an hour and a half north to Todos Santos. A recent online search found round-trip flights from New York on American, United, Continental and Delta with one stop starting at around $300 for travel in May. Most places around Todos Santos are down long dirt roads and do not have proper addresses. Hotels and restaurants use kilometer markers off Highway 19, which is the main highway through the area. Rancho Pescadero (KM 62; 52-1-612-135-5849 or, in the United States, 910-300-8891; ranchopescadero.com) is the prettiest hotel around and has a fantastic restaurant, seaside daybeds and 12 rooms starting at $185. The charming colonial Todos Santos Inn (Calle Legaspi 33, Todos Santos; 52-612-145-0040; todossantosinn.com) smack in the center of town has a cozy bar for post-dinner drinks. Double rooms start at $125. Hotelito (52-612-145-0099; hotelitotodossantos.com) has a lively bar and modern pool area and is located just outside the town center. Call for directions. Rooms start at $90. [Note: CalyCanto Casitas is a boutique resort community with vacation rentals on a gentle slope overlooking the Pacific Ocean. 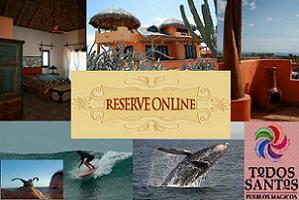 Rent your own 2BR Casita, with full kitchens, high speed broadband, satellite television and Palapa roofs. See www.CalyCanto.com]. Suki’s (Calle Hidalgo, between Rangel and Cuauhtémoc; 52-612-145-0847) has a great selection of Asian dishes — try the pad Thai — and is tucked away in a lush, tiered garden. Café Santa Fé (Calle Centenario, 4; 52-612-145-0340), whose owner hails from Milan, serves authentic Italian food; the margarita pizza and pesto spaghetti are highlights. Galería de Todos Santos (Calle Juárez; 52-612-145-0500; galeriadetodossantos.com) has the best collection of Mexican art in town. Galería Logan (Calle Juárez y Morelos; 52-612-145-0151; jilllogan.com) features the work of the expatriate artist Jill Logan. Gabo Galería (Calle Márquez de León; 52-612-145-0514; [email protected]) is open a few hours a week (call ahead) and shows the work of the area’s most renowned artist, Gabo. The Leatherback Turtle Restoration Project (52-612-145-0353; todostortugueros.org) will take guests on nightly patrols. Mario Becerril (52-612-142-6156; mariosurfschool.com) teaches surfing at all ability levels.